With expanding demand for good-quality healthcare, comes the challenge of controlling healthcare costs. 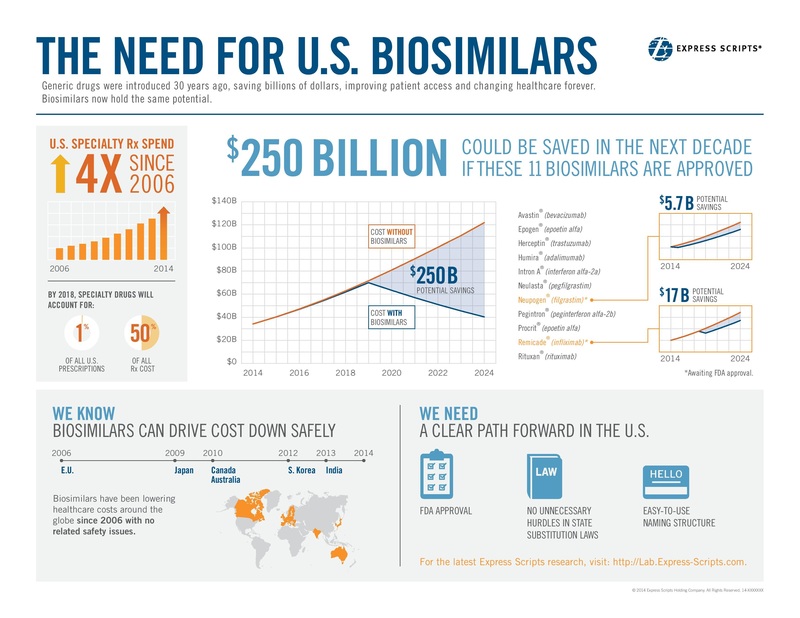 The safe and regulated introduction of biosimilars into the market has been forecasted to increase and improve access to much needed biologic medicines and reduce costs. A biologic medicine is a large molecule typically made from living cells and used in the treatment, diagnosis or prevention of disease. Biologic medicines include therapeutic proteins, DNA vaccines, monoclonal antibodies and fusion proteins. Biologic medicines are often 200 to 1,000 times the size of widely used small molecule drugs and are far more complex structurally. They are also highly sensitive, making them more difficult to characterize and produce. Unlike generic medicines where the active ingredients are identical, biosimilars – by definition – are not likely to be identical to the originator biologic. They are similar, but not the same. Biologics made by different manufacturers differ from the original product and from each other. Currently, state governments across the country are holding hearings to debate the framework in which biosimilar products are introduced in their state. The policy on whether one biologic product may be substituted by dispensers when a different biologic product was prescribed is governed by state law. Innovator biologic manufacturers, biosimilar manufacturers, pharmacists, and physicians are well represented in the discussions. We must make sure the patient voice is not forgotten in this pivotal time! As a 50 State Network Advocate now is your time to shine. 45 U.S. states and territories (as of May 2018) have passed legislation expanding access to biosimilar medications, while keeping patient safety a top priority. This incredible milestone is a win for patients across the country suffering from chronic illnesses. Not only have over 200 million people gained a pathway to these potentially life-saving medicines, but patients in the remaining states and territories can have a renewed sense of hope, as legislation is gaining momentum across the country. Substitution should occur only when the FDA has designated a biologic product as interchangeable. The prescribing physician should be notified of any substitution. The patient, or the patient’s authorized representative, should, at a minimum, be notified of any substitution. The pharmacist and the physician should keep records of any substitution. A great explanatory video by the Medical Chronicle about Biologics and Biosimilars. 1 As patients, our core concerns are to safeguard safety and the physician-patient relationship. 2 Transparency and communication between patients and their treatment teams is paramount. We believe that there are certain CORE principles that should be used as a guide for Biosimilar substitution policies. > Substitution should occur only when the FDA has designated a biologic product as interchangeable. > The prescribing physician should be able to prevent substitution. > The prescribing physician should be notified of any substitution. > The patient, or the patient’s authorized representative, should, at a minimum, be notified of any substitution. > The pharmacist and the physician should keep records of any substitution. Specialty medication spending has increased four times since 2006. As of 2018 specialty medications account for 1% of US prescriptions, but 50% of US cost.